While your pool filter will do a great job of cleaning your pool, it isn’t able to do the job alone and that is where you need the best pool skimmer. It’s going to be able to take out any debris that is floating on the water to leave you with a nice, clean pool. In order to find the best swimming pool simmer there is a lot to consider as there are many types available from manual skimmers, ones that sit in your pool and there are even remote controlled skimmers too. In our buying we will explain what a pool skimmer is used for, why it’s important and how to find the best one for you. 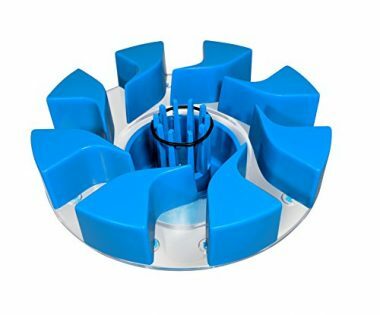 We have also completed a pool skimmer review on the 10 best products on the market, allowing you to choose the perfect skimmer for you. The amazing thing about this pool skimmer is that it comes with a 100% lifetime guarantee. If anything goes wrong with your skimmer or if parts break, then you can give them a call, and they will give you a replacement part. They are pretty sure that this pool skimmer is going to last, and I do not blame them. The frame is super-strong and the winged handle offers comfort and durability. The frame is designed not to twist or bend and also the nylon bag is very effective and very strong. The bag will catch all of the particles in your pool, and when you are done, it is very easy to empty and clean. This is an easy glide scoop which will fly through the water and have everything picked up in no time. This wall-mounted skimmer attaches to the side of your above-ground pool to skim off any debris before that might fall to the bottom of your pool. You can attach this to almost any above ground pool with the easy mount, which is fully adjustable. You then attach the filter to your pool pump, and you are ready to go. The durable polypropylene plastic is durable and strong. The long-lasting material will also unaffected by the chemicals in your pool. You can also remove the stringing basket to clear out the debris and keep the skimmer working as it should, and your pool clear of mess. This is a great basic pool skimmer. It is also a very affordable pool skimmer. The handle is made for aluminum. This means you have a handle which you can trust. We like aluminum handles as they are strong and lightweight. You can move the skimmer through the pool with ease, but you also know that if you have to apply some force to the skimmer, the handle is not going to bend or break. The bag is made from nylon, which is going to hold up for years and is not going to rip or tear through regular use. 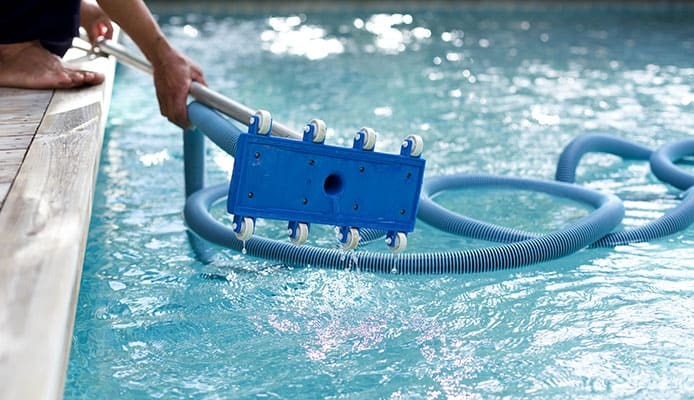 We like that you can take off the long handle and use it in smaller pools or hot tubs. You can then attach the handle and use it to skim through a large pool. This is a great multifunction pool skimmer if you have a combination of pools and hot tubs. This pool skimmer is extremely easy to use. Simply attach it to your pump system, set it in the pool, and let the skimmer do the rest. The water will be drawn to the award-winning skimmer, where the large and small particles will be trapped before the water flows back out and into the pool. The thing we love most about this pool skimmer is that it is self-adjusting to the water level. Many pool skimmers only work when they are on the surface of the pool. As water evaporates, the skimmer is too high. If water is added, the skimmer is too low. This skimmer self-adjusts so that it is always at the surface of the pool. 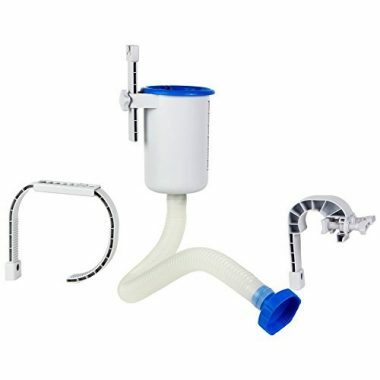 This skimmer will clean your pool and ensure that the filtration system will not be overworked. Once the skimmer is working, there is minimal work to be done, making this one of the easiest pool skimmers to use once it is installed. This is a compatible add-on device for all bottom cleaners on the market. 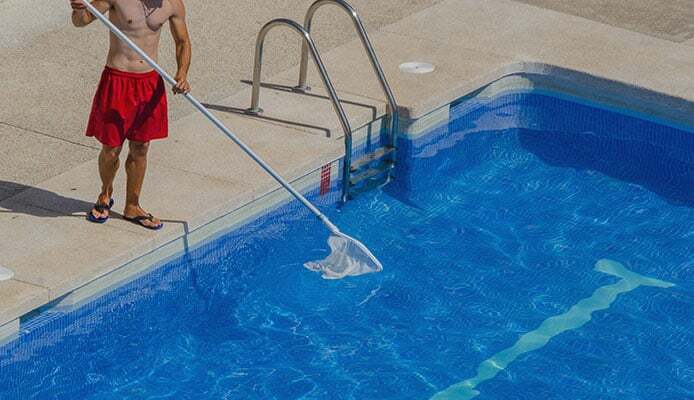 When the bottom cleaner moves around, this pool skimmer will move in sync with it. This skimmer uses whirlpool power to capture the particles in the school. The pool skimmer will make its way across your pool and will visit more areas than other skimmers are capable of. This is a great skimmer for leaving in large pools and coming back to it being all clean. 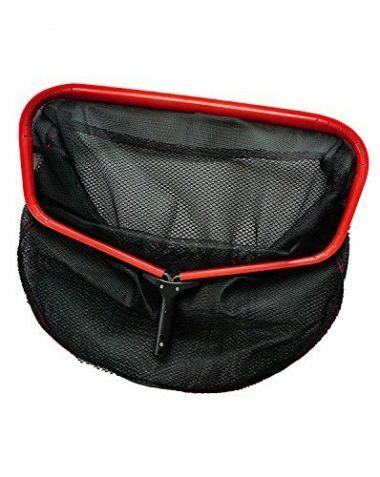 This is a professional-grade skimmer with an extra-large 18” mesh area to give you the best coverage. Your cleaning time is minimized to cut your maintenance time by up to 50%. We love anything which cuts down on our cleaning time. The heavy-duty aluminum frame gives you complete control over the mesh bag while being lightweight and easy to move through the water. The ABS coating creates smooth and less resistant edges. This means that you will not damage any materials as you are dragging it through the pool. There is a durable dual-layer mesh which will ensure that you get the smallest particles from your pool. This helps you to capture the smallest particles before they fall to your pool floor. This is a great pool skimmer for your pool at home or for any pools you may clean on a professional basis. This is a great pool skimmer for getting the job done. If you want a pool skimmer to replace the one which is taking you too long, then this is the skimmer for you. 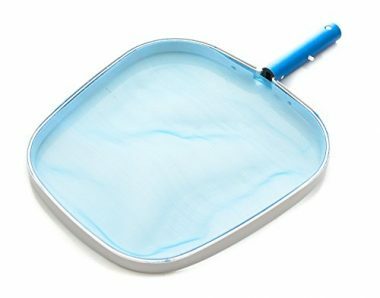 This pool skimmer is light, easy to use, and, more importantly, can be dragged through the water with ease. The net is tapered for easier use. It also empties at the flick of a wrist. A very effective pool skimmer. This is one of the most fun skimmers our list, and one which children will love. A great way to trick children into doing some work for you. 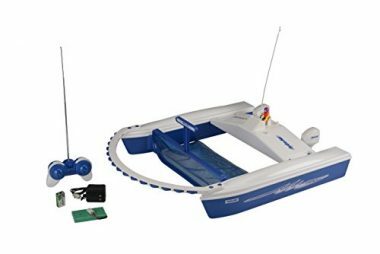 You control this boat with a remote control and drive it around your pool. As it navigates the pool, it will pick up any particles. On a single charge, the batteries will last for 5 hours. More than enough time to clean your pool. The boat also has a range of 100m. This skimmer floats in your pool, so you do not have to worry about the water level. No matter what the water level, this pool skimmer will continue to work. It also works for any size and shape of the pool. The skimmer will also move in random directions which helps to pick up debris more effectively than skimmers which are stationary or move in a defined pattern. 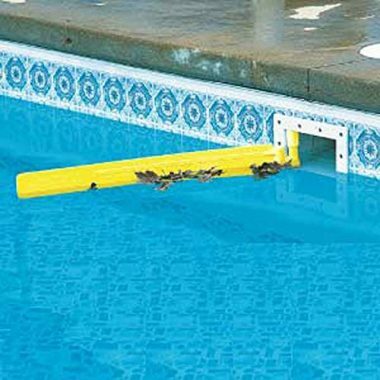 This is a very easy pool skimmer to install, and once it is, a very easy pool skimmer to use. 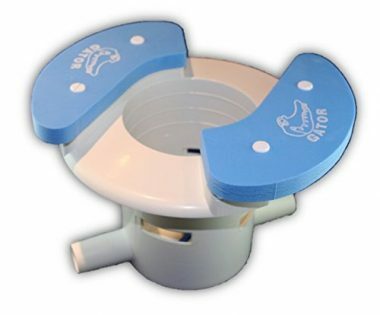 This addition, for your pool skimmer, fits with most automatic pool skimmers and cuts the cleaning time by up to 75%. Most automatic pool skimmers pull the water towards them to skim particles from the surface of the water. As the water is pulled around, the water begins to swirl around the pool. Debris is pulled past the pool skimmer, but it may take a few passes for the skimmer to collect it all. This attachment catches the particles before they can get past. They are then slowly pulled into the skimmer. This attachment is easy to use and helps you to save money by not having to run the pool skimmer for as long. When it comes to pool skimmers, you often have a trade-off between the ease of use and the cost. What we mean is that you can often get automatic pool skimmers which need minimal interaction, but cost a lot, and you can get manual pool skimmers which need to be used by you but are relatively cheap. Let’s take a look at the three main types of pool skimmers. Manual skimmers are tools which you will use to remove debris from your pool. 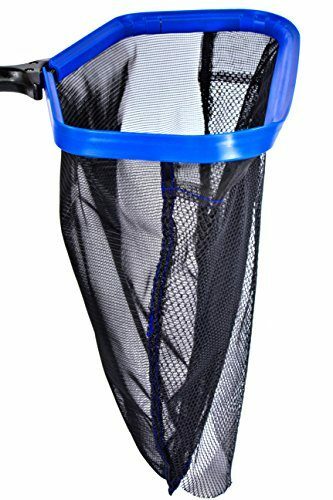 They are basically fine mesh bags which are connected to a long pole. They look like large fishing nets and work in much the same way. At their most basic, this is all that manual skimmers do. 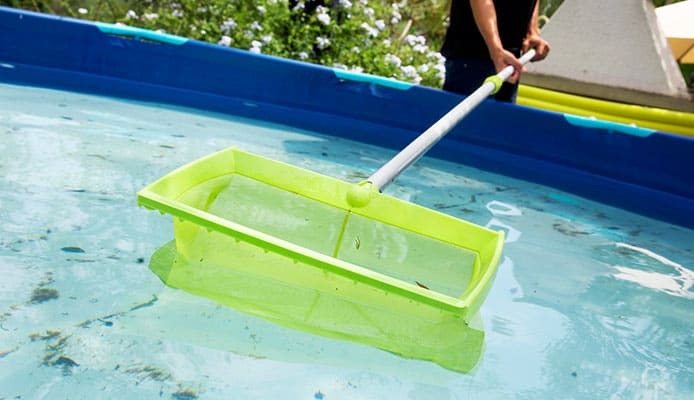 You use it to fish large debris from your pool and then dump it out in the garbage. Some advancements in manual skimmers allow you to connect to your pool pump to pull the water through the skimmer. This makes it easier to gather the debris, as they are pulled toward you. You could also use these in above ground pools and hot tubs. Automatic skimmers attach to the pump inlet of your pool. They use the power of your pool’s pump system to pull the water through the skimmer and catch the debris. They usually have some sort of propulsion system to move them around your pool in a random pattern. This allows them to cover a large area of the pool. They do not often get stuck, but there will be times when you need to move them to other parts of the pool. Self-contained skimmers are new on the market but do not connect to your pool’s pump system. Instead, they are powered by the sun and move around the pool independently. They collect up the debris in a self-contained unit. Self-contained skimmers are more expensive than other skimmers on the market, but they do use less power than automatic skimmers, so they could save you money in the long-run. When you are looking at the ease of use, manual skimmers are easy to use and relatively straightforward. You push the net through the water and gather up the debris. The automatic and self-contained skimmers need to be turned on and off, but you should be able to leave them to it once they go to work. The hardest part of using them may be the setup and installation. You should try to find out how easy the unit is to install before you buy it. Many times, you can find that information in the customer reviews. If the product is hard to install, then someone will tell you about it. You can also look up installation guides on YouTube, and see if you can find the installation video for the skimmer you are looking at. The technology of skimmers has advanced so much that you would be hard pressed to find a skimmer which is not easy to install. When you do get your skimmer, take the time to go through the instructions and follow them. If you follow the instructions, then you will have no problem installing your skimmer. You want your skimmer to last as long as possible. With every product we review, we always recommend spending a little more money to get a product which is not going to break down on you. Cheaper products may seem appealing at first, but they can cost you a lot more money in the long run. Look for a unit which is made of high-quality materials. The better the materials, the longer it will last (generally). You should look for a trusted company who are going to put the unit together well. You should also look for a company which has good customer service. Should anything go wrong with your product, they should be on hand to help. Lastly, check the reviews. Over time, people will come back to update their review if it has performed exceptionally well or exceptionally poorly. If you see a lot of negative reviews, then you know to stay away. You want to find a mesh which has big enough holes to let the water through easily, while still being small enough to trap as much debris as possible. 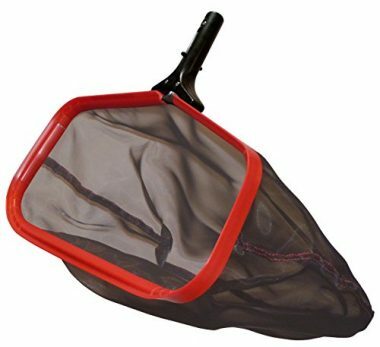 There may be a trade between a mesh which can catch almost anything and a mesh which flies through the water with ease. You also want a mesh which is going to last. If the mesh is going to tear or rip after a few uses, then it is next to useless. Look for a mesh made of high-quality material. You are not going to be looking for a warranty with a manual skimmer. They are straightforward, and not much can go wrong with them. If something does go wrong, it was probably human error, and would not be covered anyway. Where you do want to look for a warranty is with the automatic and self-contained skimmers. There is a lot more that can go wrong with them, and when it does, it is never usually your fault. A one-year warranty should be the minimum you are looking for. A three-year warranty is what we would recommend, and if you can find a 5-year warranty, well, all the better. Your pool skimmer is likely going to be out in the sun all day. This means that it is going to be constantly bombarded with UV rays. We all know that UV rays can damage our skin, but not many of us know that the UV rays can damage our pool skimmers. Our manual skimmers will be in storage most of the time, and even when they are out, it is not for long. If they are hit by the UV rays, they may fade, but they will still work. We should be more concerned about our automatic and self-contained skimmers. The plastics in the skimmers (along with other materials) can degrade when left in the sun for long periods of time. We would recommend looking for a pool skimmer which comes with a UV-resistant coating, is made of metal, or is made from another material which is resistant to UV rays. You will need to clean out your skimmer every so often. Mainly, this will be to clean out the large particles such as bugs and leaves. With a manual skimmer you will be doing this every time you drag the skimmer through the pool. Debris is the reason why you should cover your swimming pools and hot tub and a regular or solar pool cover will give you a good amount of protection from this debris and a pool cover reel will allow you to cover it easily but while covering your pool will be a massive help in keeping debris out of your pool, debris will still get in. With the automatic cleaners, there will be a compartment which you should be able to remove and empty. Every so often you may need to give the skimmer a more thorough clean. This could mean rinsing the compartment in water or doing a full clean of the unit. Consult your instruction manual to find out more about cleaning your skimmer. There are many types of pool cleaners that are going to help with your pool cleaning with a pool vacuum head or pool cleaners able to keep your water clear. This is in conjunction with you filter and pool skimmer to keep everything clear. Q: How Do I Maintain My Pool Skimmer? A: Pool maintenance is important in all aspects of your pool. Manual pool skimmers are the easiest to maintain as all you have to do is make sure that you clear everything out of the mesh. You do not want to leave any organic matter in the mesh as bacteria can begin to grow, and then you will be transferring it back to your pool, and setting yourself up for more problems later. Remove all the debris and then rinse the mesh under some water. If you let the skimmer dry in the sun, then the sun can bleach it and get rid of the bacteria for you. To maintain an automatic skimmer, you should check the container regularly, depending on the area you live in, and make sure that you empty it. Always clean out the container if you believe that the water flow is going to be compromised. Every week, you should make sure that the skimmer is functioning, and if it is not, you can use your instruction manual to troubleshoot any problems. For regular maintenance, all skimmers are different, so you should consult your manual for that too. It is important to perform regular maintenance on your pool skimmer to ensure that it lasts as long as possible. Q: What Is A Pool Skimmer Basket And What Does It Do? A: This is the part of the pool skimmer which collects the particles. The basket is designed with small enough holes to allow the water to flow through, but not and large debris such as leaves and bugs. Skimmer baskets are set up to catch water which flows in from the pool. Q: How Do Pool Skimmers work? A: Manual and automatic pool skimmers work in much the same way. The water is dragged through a filter, and the large particles are caught and trapped. With a manual skimmer, the force comes from manually moving the skimmer through the water, and with an automatic skimmer, the water flows through the skimmer, trapping the particles. Most pool skimmers work by drawing themselves across the surface of the water to skim off the materials, or drawing the surface of the water to the skimmer to trap the particles. A manual skimmer is used when people are out of the pool, but an automatic skimmer is used when people are in the pool. The automatic skimmer may be switched on all the time. The suction is enough to draw the surface of the water towards the skimmer, but not enough to be noticeable when you are swimming. With an automatic skimmer, there is a hanging door inside to ensure that only the surface of the water is drawn in. This stops the skimmer from using too much power. It also ensures that it traps the particles more efficiently. The angle of this door ensures that, once the particles are inside, they cannot get back out again. The contaminants will dow into a collection basket, much like the mesh in a manual skimmer. Q: How Often Should I Clean My Pool With A Pool Skimmer? A: Mostly, that depends on how much debris gets into your pool. If your pool is situated under some towering trees, and it is the fall, then you may have to do it every day if you do not have a cover for your pool. If you do not have as many trees around your pool, then you may get by with skimming it every couple of days, or once a week. If you have an automatic skimmer, then you can leave it running, and you do not have to worry about how often you skim your pool. Q: Why Do I Need A Pool Skimmer? A: All pools get dirty. You can try all you want, but something is going to get in there. 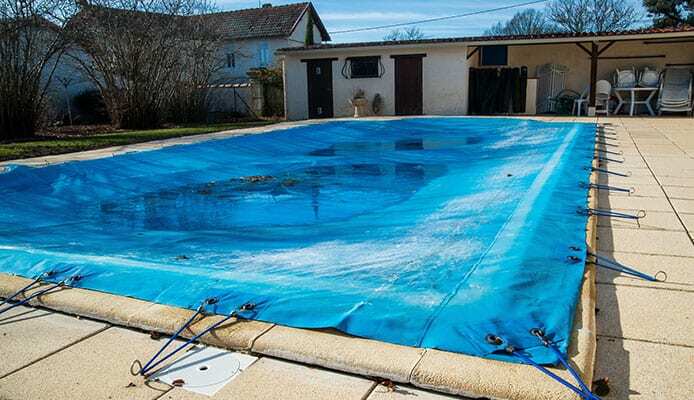 You could have the best pool cover, you could have the cover on 99% of the time, and you could have everyone shower before using your pool, but still, you would find some debris in there. If the debris is left, then it overwork your pool filter and pump system. The internal filter can get clogged up, and one of two things could happen. You may have to replace the filter if it gets too clogged, or you may have to replace the entire system if the pump is overworked and under a lot of stress. Pool skimmers stop this from happening and extend the life of your pool. They help you in removing the debris from your pool which could clog up your pump system. As the pump works harder, you use more power, and it costs you more money. You do not want to be paying for your pump to work harder, and you do not want to have to pay for a new pump when it breaks down. The other reason to remove the organic matter is to stop bacteria from growing. If organic matter sits in water for a long time, with access to oxygen, then bacteria and other things are going to begin to grow. This can lead to all sorts of problems, including having to replace the water in your pool. Removing the debris also makes your pool a nicer place to swim and relax in. Whether you need to know how to remove sand from your pool or you need to know how to clean tiles at the swimming pool waterline, it’s important to know how to properly clean your pool and a skimmer is a vital part of that. A pool skimmer is a low-cost way to save you a lot of money in the long run. All of the pool skimmers on our list will help you to maintain your pool and ensure your pump system lasts. Our buying guide will help you to make an informed choice for you to take the hassle out of cleaning your oil with one of the best skimmers around.